Aldershot midfielder Scott Donnelly hopes to impress the club's fans after re-joining the League Two side. The 24-year-old signed a short-term deal with the Shots this week. He told BBC Surrey: "I was a bit surprised when it came about but it's given me the option to come here and show the fans I am an improved player. "I like to think I'm in a lot better shape than I used to be. It may take me time to get match-fit but when I am on the pitch, it'll be non-stop running." 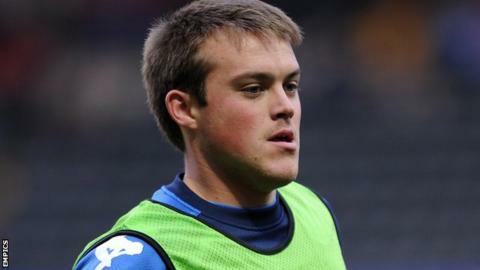 Donnelly, who was released by Swansea earlier this season, has not played a League game since December last year when a cruciate ligament injury ended a loan spell at Wycombe. He added: "I'm more professional, more experienced and technically I'm better. "Fingers-crossed the fans will see a difference and it will be a good difference." Donnelly left the Shots to join Swansea City, who were then in the Championship, two years ago. However he enjoyed a frustrating spell with the Welsh side after Paulo Sousa, the manager who signed him, left the club within days of Donnelly joining. "It was a massive opportunity for me," he continued. "There was no doubt in my mind I had to do it. "It started well in pre-season but when Brendan Rodgers came in, the first game he had I probably had one of the worst games I've ever had. "I stuck it out for a while and managed to get on the bench but it wasn't meant to be and I went on loan to Wycombe. The injury derailed me."